Every sip is like a taste of pumpkin pie! If a cookie-crumb rim is desired, moisten the rims of two cocktail glasses with water. Place cookie crumbs on a plate; dip rims in crumbs. Set aside. Fill a mixing glass or tumbler three-fourths full with ice. Add the remaining ingredients; stir until condensation forms on outside of glass. Strain into two chilled cocktail glasses. Yield: 2 servings. 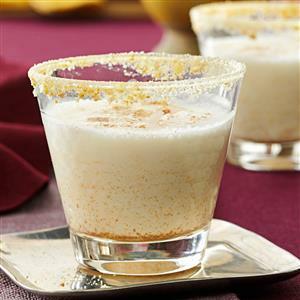 Editor's Note: You may substitute 1 ounce pumpkin flavoring syrup for the simple syrup and pumpkin pie spice. Look for flavoring syrup in the coffee section. To make ahead: Prepare a martini mix of vodka, milk, cream, syrup and liqueur. Shake mix before using; pour 1 cup into the mixing glass for each batch of drinks. Add spices and proceed as directed. Editor's Note: This recipe was tested with Torani brand flavoring syrup. Look for it in the coffee section.